Michael Cohen, former personal attorney for President Donald Trump, told a Congressional committee Wednesday morning that the president was aware his longtime associate, Roger Stone, was in communication with Julian Assange of WikiLeaks about plans to dump a massive collection of hacked Democratic National Committee emails. In his opening testimony before the House Oversight and Reform Committee, Cohen said that in July 2016, days before the Democratic convention, he was in Trump’s office when the then-candidate’s secretary announced that Roger Stone was on the phone. “Mr. Trump put Mr. Stone on the speakerphone. Mr. Stone told Mr. Trump that he had just gotten off the phone with Julian Assange and that Mr. Assange told Mr. Stone that, within a couple of days, there would be a massive dump of emails that would damage Hillary Clinton’s campaign. Mr. Trump responded by stating to the effect of ‘wouldn’t that be great’,” he testified. 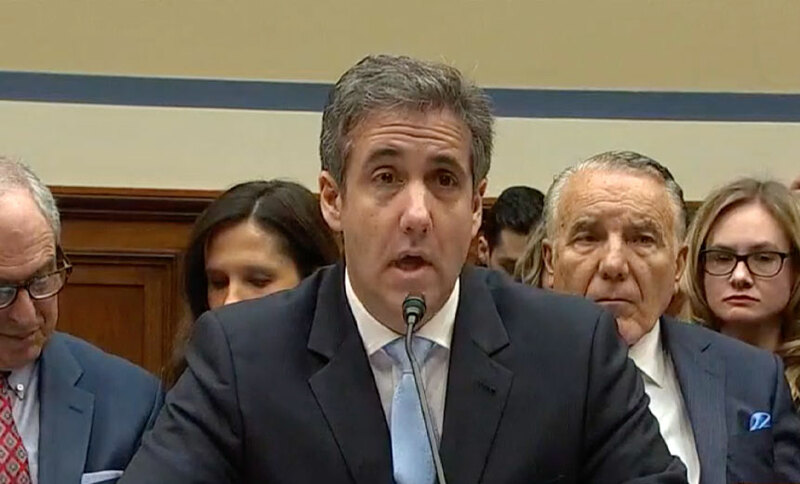 Two GOP committee members complained at the start of the hearing that the panel did not receive Cohen’s written testimony 24 hours before the hearing as required by its rules. But committee Chairman Elijah Cummings, D-Md., led a move to reject the GOP efforts to delay the hearing to allow more time to review written testimony and other documents. Cohen is slated on May 6 to begin a three-year federal prison sentence after pleading guilty to eight counts of campaign finance violations, tax fraud and bank fraud. “It’s laughable that anyone would take a convicted liar like Cohen at his word, and pathetic to see him given yet another opportunity to spread his lies,” White House Press Secretary Sarah Huckabee Sanders said in a statement released Tuesday. Rep. Jody Hice, R-Ga., accused Cohen of having “an agenda to bring the president down,” adding that Cohen cannot be trusted. “This is the first time in history of Congress of [having a hearing with testimony by] someone convicted of lying to Congress,” Hice said. An unsealed federal grand jury indictment against Stone charges him with having served as a nexus between the Trump campaign and WikiLeaks, and then lying about it to Congress (see: Trump Adviser Stone Charged with Lying About WikiLeaks). The indictment against Stone does not state the identity of the senior Trump campaign officials. According to the July 2018 indictment, Organization 1 “released over 20,000 emails and other documents stolen from the DNC network by the conspirators,” just days before the Democratic National Convention. “The latest-in-time email released through Organization 1 was dated on or about May 25, 2016, approximately the same day the conspirators hacked the DNC Microsoft Exchange Server,” the indictment states. “What struck me as I looked back and thought about that exchange between Don Jr. and his father was, first, that Mr. Trump had frequently told me and others that his son Don Jr. had the worst judgment of anyone in the world. And also, that Don Jr. would never set up any meeting of any significance alone – and certainly not without checking with his father. Why haven't the old threads been restored?? Can Amazon upset the advertising duopoly?